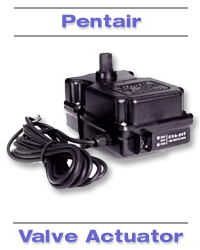 Pentair Valve Actuator for solar or pool controls. Pentair Pool System Actuator Model CVA24T provides automatic pre-programmed switching of the water supply from one feature to another. Prevents dead-heading of pumps. Operates Pentair, Compool, Ortega or Jandy Valves. Product Manufacturer: Pentair Water Pool and Spa, Inc.